CyberLink Media Suite v10 Ultra is designed to give you the ultimate in entertainment, creativity, burning and sharing, and is now supercharged with 3D! This suite is actually 11 software titles in one value pack - including PowerDVD12, Blu-ray and Media Player, PowerDirector 10, a fast consumer video editor, Power2Go 8 to burn any data on any discs, and so much more. Packed with the tools you need, you will be able to enjoy Blu-ray and DVD movies, create your own Hollywood productions, share videos and photos to your social communities, organize your media in ways and burn discs to back up your content. With CyberLink Media Suite v10 Ultra, there are no limits to what you can do! Organize and Play - Organize your media content, and play Blu-ray movies, videos, photos and music. Edit and Convert - Edit home videos with pro-like effects, and convert media to enjoy on mobile devices. Backup and Burn - Backup data and burn discs. Protect data with 256-bit data encryption. Everything 3D - Play 3D movies, videos, and photo. Create amazing 3D videos, too! Share and Socialize - Share your videos and photos with the world, and browse media form social network. Note: Computers that do not meet the minimum requirements for CyberLink PowerStarter 10, will use a version without background images. 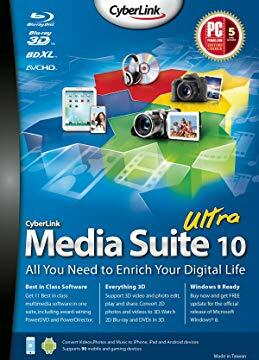 Note: CyberLink Media Suite contains 11 CyberLink products, if you already have the same software installed on your computer, Media Suite 10 installation will overwrite the same software, such as PowerDVD 12 Ultra or PowerDirector 10 Ultra, and some features might not be available on software included in Media Suite 10. You can select the optional installation, and uncheck the program you already installed on your computer, to remain using your existing version. NOTE: This title is non-returnable once the software package has been opened. Standard Retail License for 1 User.